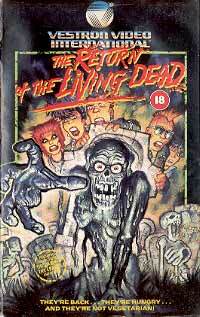 Written and directed by Alien creator Dan O'Bannon, this hilarious twist on the more serious zombie themes of George A. Romero successfully twists the classic series in a new unexpected direction. Here the zombie infiltration results from government experiments with undead bodies locked into pressurized containers for military purposes. A young guy starts working at a medical supply warehouse where one such container is in storage. This is accidentally opened and the spewing gas seeps into the soil of the adjacent cemetery, not to mention the ghoulish zombie crawling from the can! 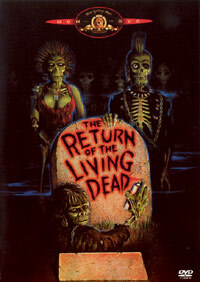 With his punk pals hanging out in the graveyard, the living dead start to rise with a lust for fresh brains! Almost every scene contains several laughs topped of with gory specialFX, and the double team of James Karen and Thom Mathews is a winner. The cool soundtrack includes songs by The Cramps.